The World Science Fiction Society Constitution allows, but does not require, a Worldcon held 50, 75, or 100 years after a Worldcon at which no Hugo Awards were presented to present Retrospective Hugo Awards for works that would have been eligible for that year’s Hugo Awards if they had been held. (Once Retro-Hugos have been presented for a given year, no future Worldcon may present Retro-Hugos for that year.) The 1941 Worldcon did not present Hugo Awards. MidAmeriCon II elected to present Retro-Hugo Awards for works first published in 1940 that would have been eligible for the 1941 Hugo Awards had there been Awards presented in 1941. The 1941 Retro-Hugo Awards were presented at a ceremony on Thursday, August 18, 2016 at MidAmeriCon II, the 74th World Science Fiction Convention. 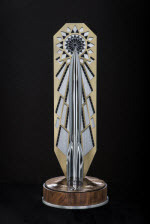 Administration of the 1941 Retro-Hugo Awards is exclusively the responsibility of MidAmeriCon II. The Hugo Awards are not administered by the Hugo Awards Web Site. 481 valid nominating ballots (475 electronically-submitted and 6 paper) were received and counted. Members of the 2015, 2016, and 2017 Worldcons as of the end of January 2016 were eligible to make up to five equally-weighted nominations in each category. After the ceremony, the Award Administrators released detailed voting breakdowns in each category and a list of the top 15 nominees in each category, along with the number of nominations received by each. Direct administrative questions about the 1941 Retro Hugo Awards to the MidAmeriCon II Hugo Administration Subcommittee. Note: “Darker Than You Think” was mistakenly categorized as a novelette and initially announced as a finalist, but later disqualified. The story is a novella, but did not receive sufficient nominations to be a finalist in that category. Note: Category had 6 finalists due to a tie for 5th place. Per WSFS rules, the categories for the Retro-Hugo Awards must be the same categories as used for the current year’s Hugo Awards. It is likely that there are some categories that had few or no eligible works published in 1940. Categories that received insufficient nominations have been dropped from the final ballot. Hey dudes , Lovercraft died in 1937! An author’s previously unpublished works may continue to be published after their death. Can we presume the “Harry Warner” nominated in the Fan Writer category is in fact Harry Warner, Jr.? Why no credits on Batman #1? We generally take the winner list as it is produced by the administering Worldcon. To be technical about it, there are also no production credits listed in Batman #1 other than Bob Kane’s artist’s signature.